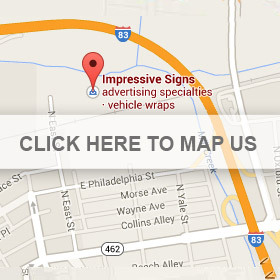 Since 1989 we have been making custom signs throughout Central Pennsylvania. We primarily cover York, Harrisburg and Lancaster and all local towns in between like Red Lion, Dallastown, Dover, Hanover, Stewartstown, Wrightsville and Shrewsbury. Our sign designers, fabricators, and installers have all worked for us for over ten to twenty years. We specialize in dimensional signs for businesses, 3D logos for interior or exterior, car and truck lettering, vehicle wraps and banners. We can handle your company trucks, vans and trailers. We also make custom yard signs, and real estate signs for commercial and residential companies. Click on the pages in the navigation for a few of our gallery samples.